With my recent posts on the Public Switched Telephone Network (PSTN) I've been getting some email questions and suggested posts. I've received a few questions on telephones (what I would call end user devices) so I thought I'd take a few posts to describe how a basic telephone works. To provide a signal to the telephone company that a call is to be made (off-hook) or a call is complete (on-hook). To provide the telephone company with the number the caller wishes to call. To provide a way for the telephone company to indicate that a call is coming in or ringing. To convert voice frequencies to electrical signals that can be transmitted at the transmitter and convert those electrical signals back to voice frequencies at the receiver. The Federal Communications Commission (FCC) has set standards for the above features and all manufacturers selling telephones in this country must match these standards or the phone will not work properly. In addition many modern telephones also come with features like speed dial, redial, memory, caller ID, voice mail, etc. These are all additional features that are not necessary to make or receive calls. 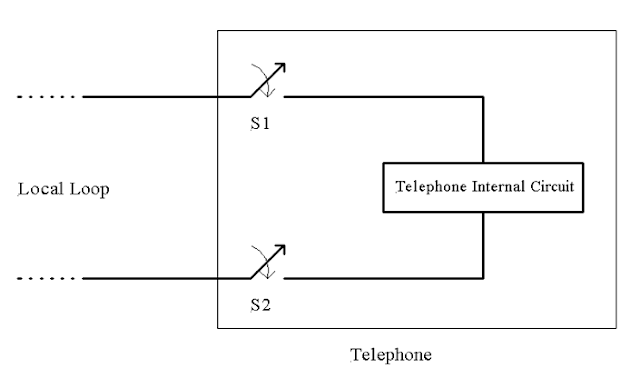 Let's look at Telephone Set Function 1: To provide a signal to the telephone company that a call is to be made (off-hook) or a call is complete (on-hook). The switchhook gets its name from the old telephones that had a hook on the side. On modern phones the switchhook is a button that is depressed when the handset is put on the cradle of the telephone. According to telephone company specifications individual telephone set DC resistance should be 200 Ω but in reality most telephones range between 150 and 1000 Ω of DC resistance. When a user picks up a connected telephone handset to make a call the switchhooks in the figure below (S1 and S2) close (off-hook condition) and the local loop circuit is complete. 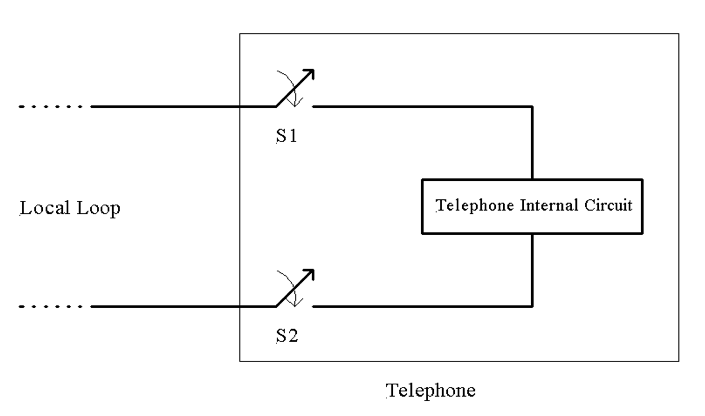 When a handset is picked up, a DC current ranging between 20 and 120 mA flows on the pair of wires connecting the telephone to the CO. This current flow causes a relay coil to magnetize and it's contacts close. In the CO current flows through a relay coil attached to the local loop wire pair. The coil energizes, it’s contacts close and the CO switch knows a phone is off hook somewhere. A line feeder in the CO switch looks for the off-hook signal, finds it and sets up a connection. In the CO switch a dial-tone generator is connected to the line so the caller knows they can dial a number. I'll cover dial-tone generation (and why cell phones don't use dial-tone) in my next post.